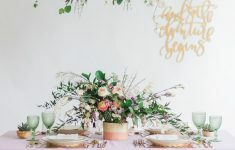 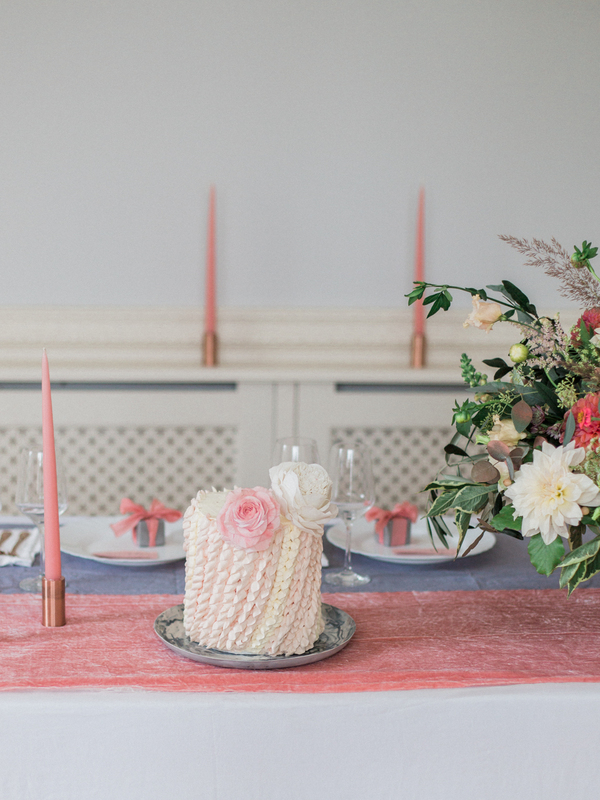 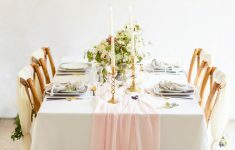 “Today we are delighted to bring you the third of our winter tablescape inspiration posts captured to perfection by Tamryn at The Barefoot Brunettes. 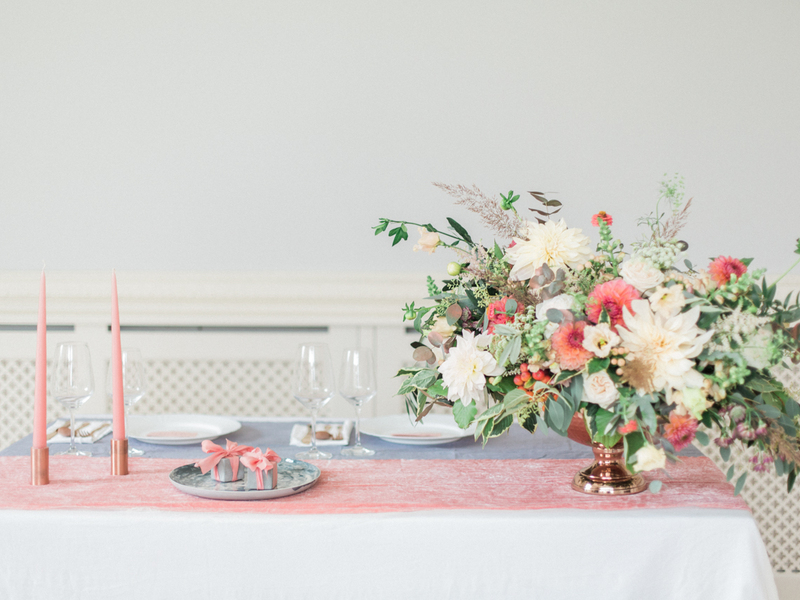 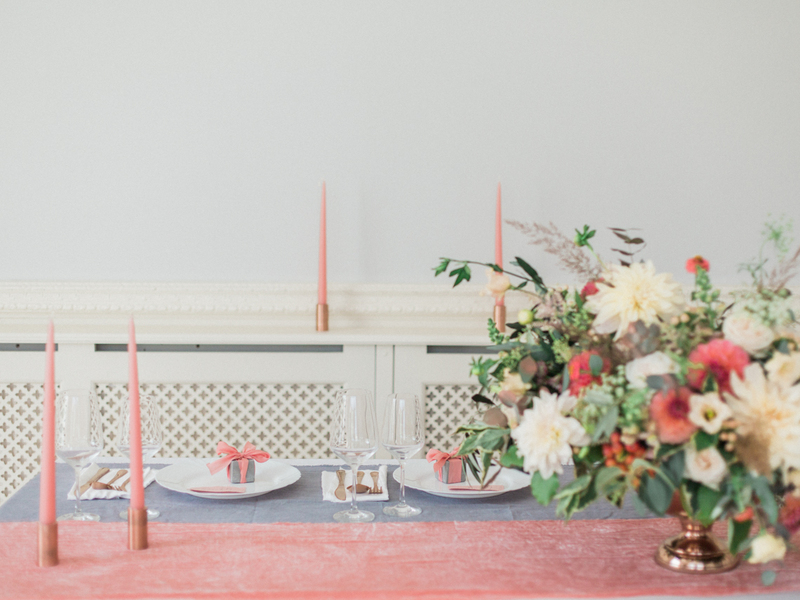 This week we’re looking at ideas for using a bolder colour palette with the modern trend for coral and grey shades with copper as the metallic accent. 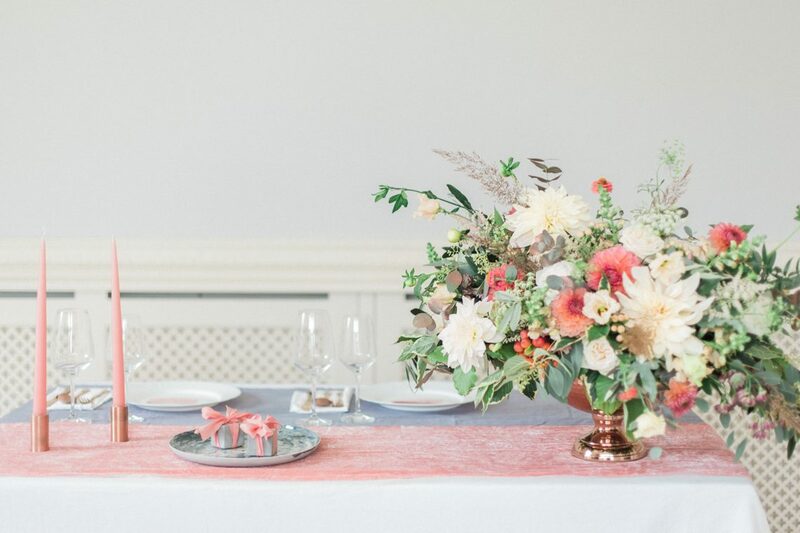 This colour palette works well with any neutral or white backdrop like that seen in the gorgeous rooms at Twyning Park and worked well with the formal vintage dining chairs from Daisy Says I Do, but would work equally well with more neutral furniture. 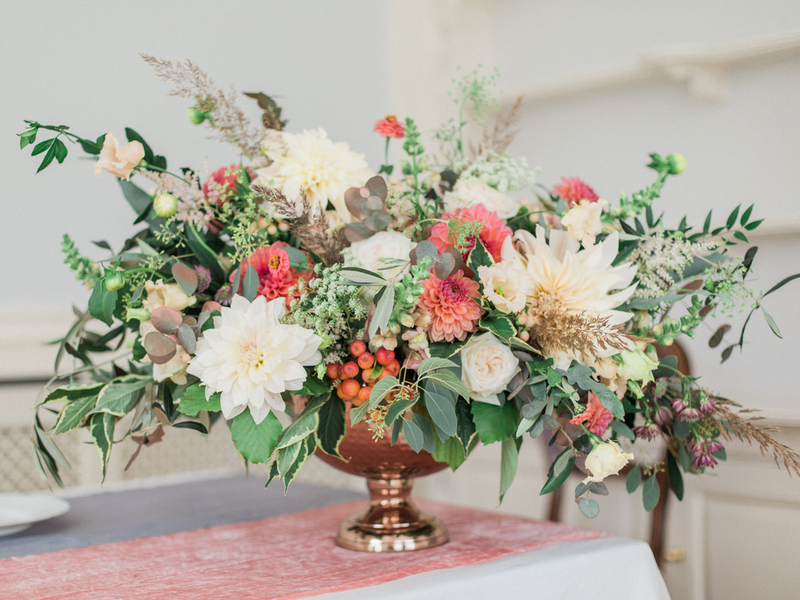 The warmth of the copper bowl paired with the coral and cream tones of the flowers makes for an interesting and eye-catching centrepiece and would be a fabulous addition to round tables or with other smaller vessels along a long table layout. 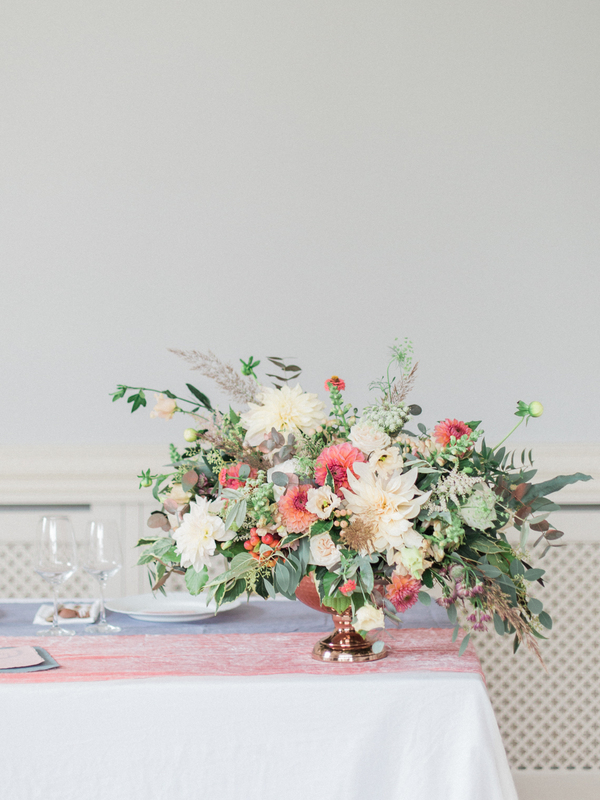 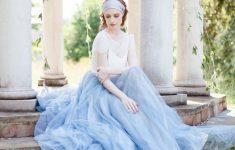 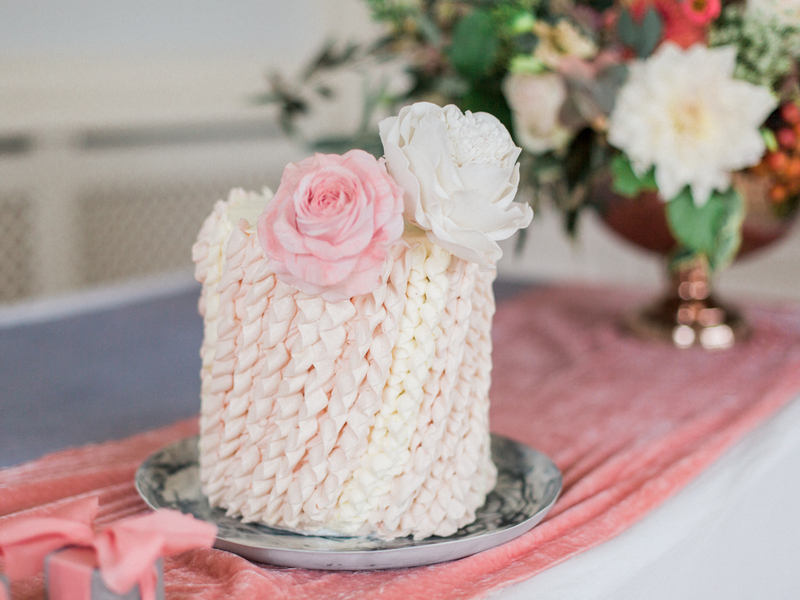 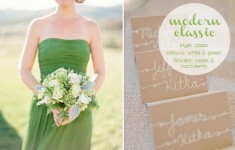 We love the overblown drama of the blooms which also stays effortlessly romantic. 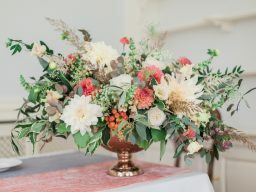 Included in this design were Cafe Au Lait Dahlias, Dahlias, Roses (Garden Ohara & wedding rose), Zinnias, Lisianthus, Antirrhinum, Astrantia, Ammi, Hypericum berries, Olive leaf, Eucalyptus, Weigela and Astilbe. 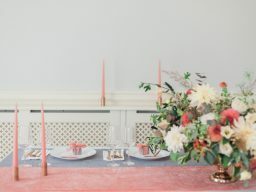 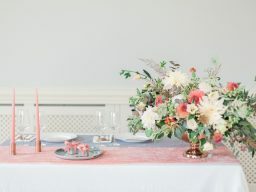 Layered table linens in contrasting colours and textures, from linen to velvet are another easy way to add an injection of colour during the winter months when everything can seem a little drab and grey, and copper cutlery can also help to tie everything in and give a touch of rosy warmth alongside elegant coral taper candles in modern chic copper holders. 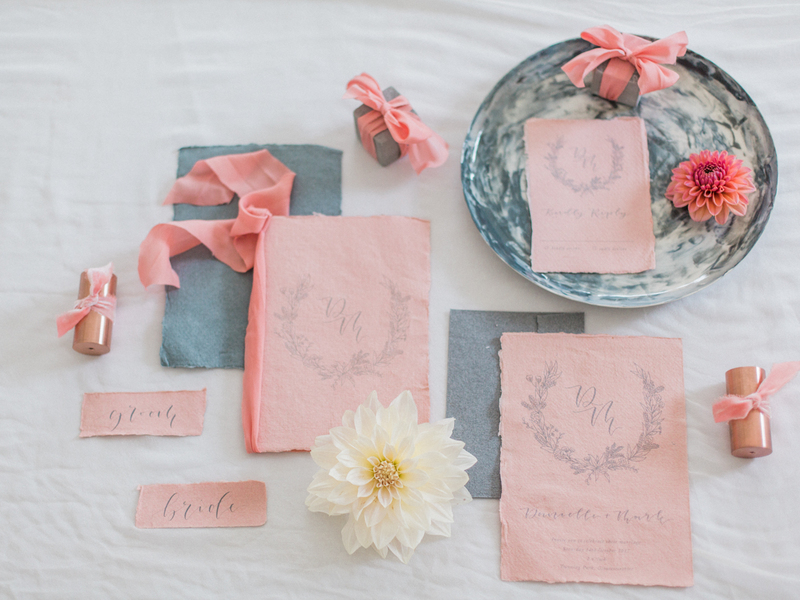 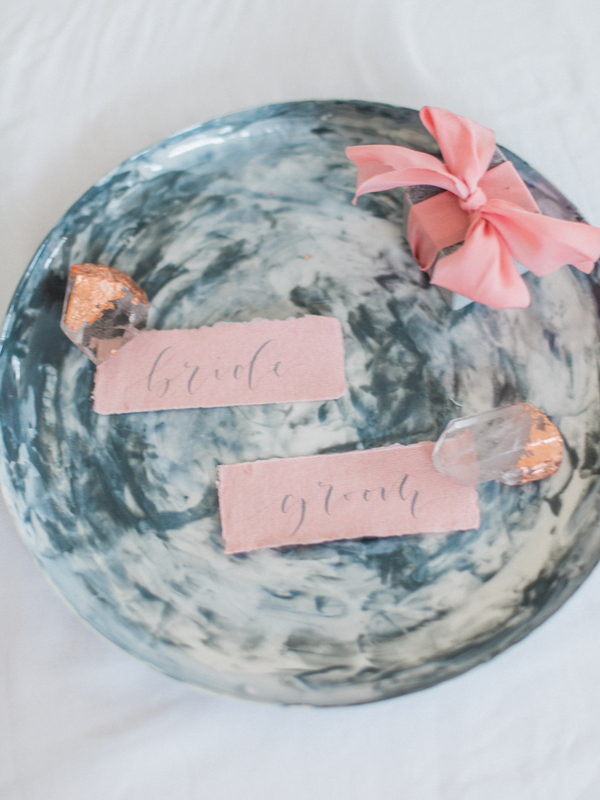 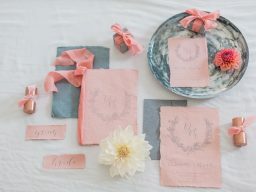 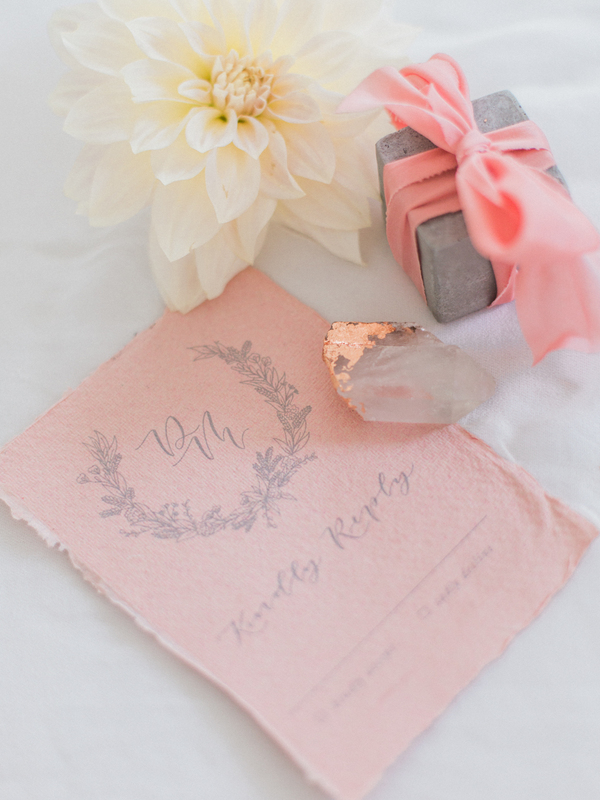 The salmon pink and grey calligraphy place cards from Oh Wonder Calligraphy add a touch of elegance and we love the delicate hand drawn wreath design of the matching invites. 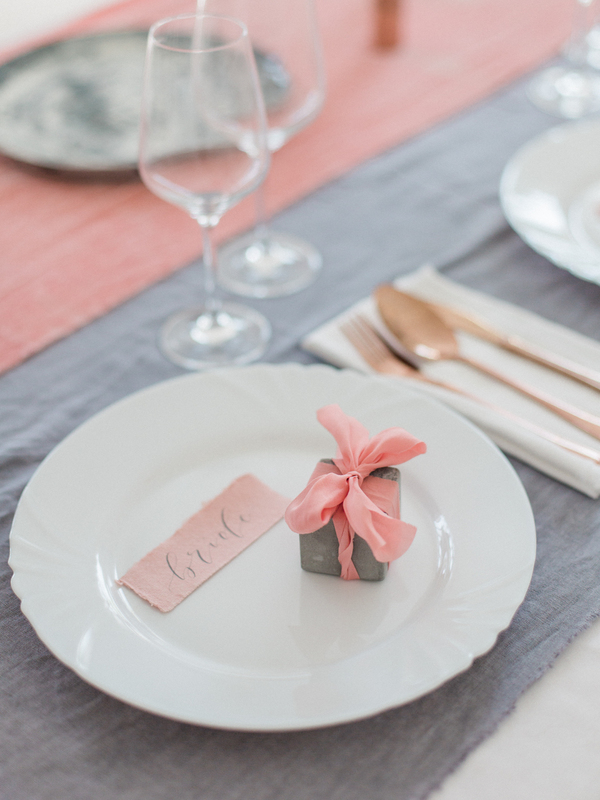 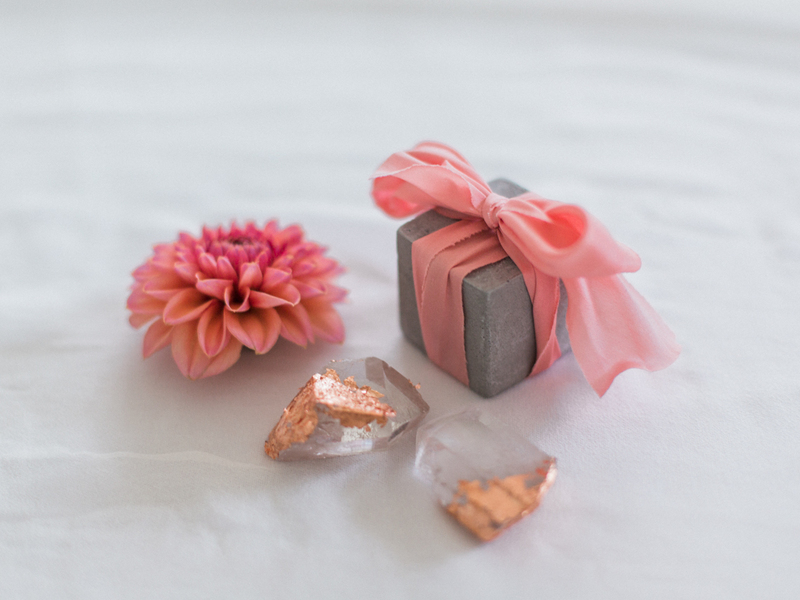 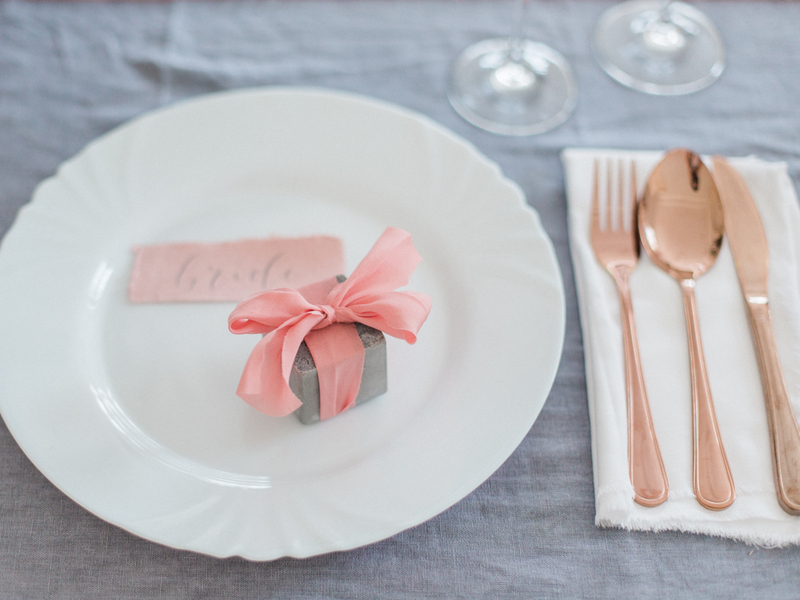 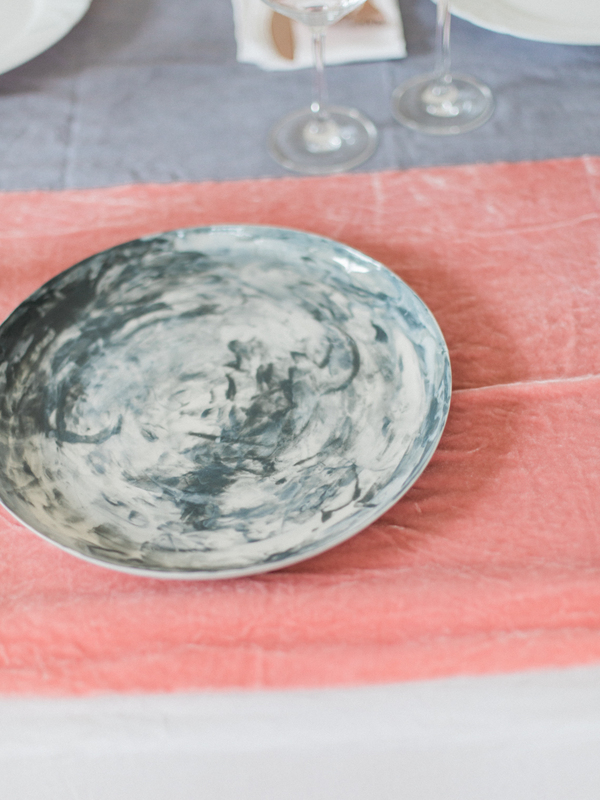 Perhaps add a rose gold gilded crystal as a wedding favour to each of your place settings. 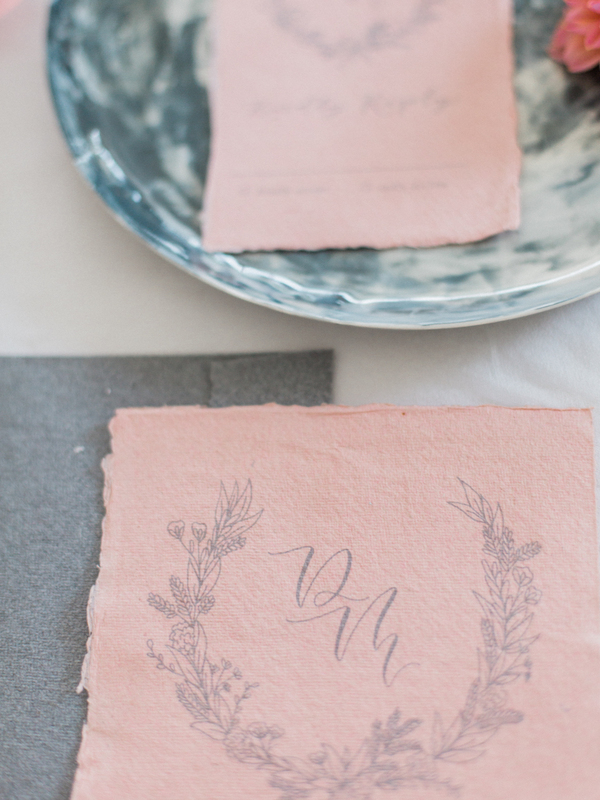 These ones by Sarie Joynes match beautifully. 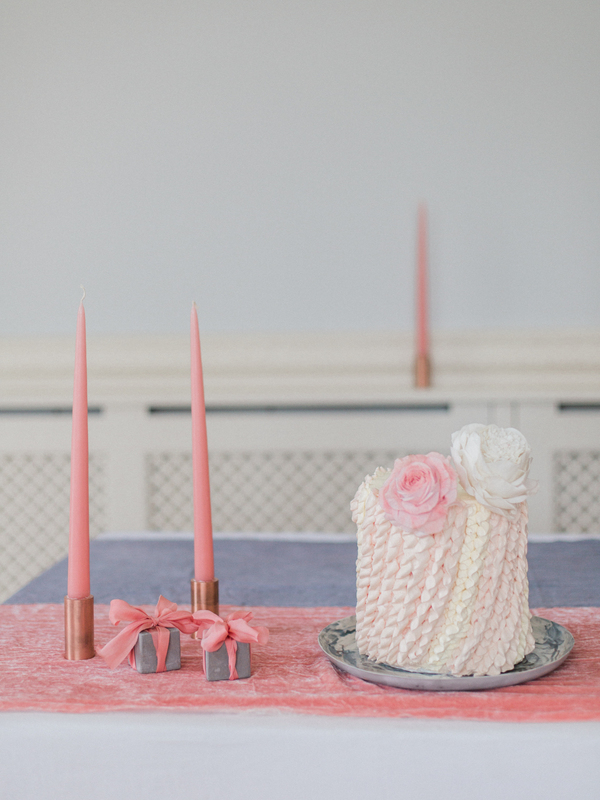 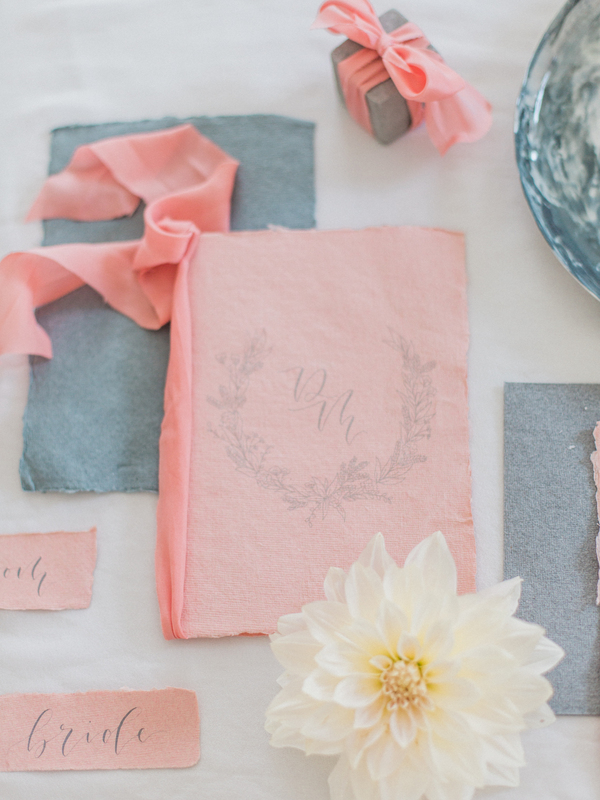 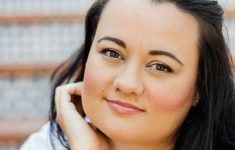 Then wrap everything up in a luxurious coral silk ribbon from Kate Cullen.